Martina McBride will appear on ABC’s Good Morning America tomorrow (8/30) to visit her friend and host Robin Roberts before she goes on medical leave. During the 8 a.m. hour, McBride will perform her hit song “I’m Gonna Love You Through It” for Roberts who announced earlier this week that she will be undergoing a bone marrow transplant and treatment for MDS (myelodysplastic syndrome). On the show, McBride will also unveil a new initiative to raise awareness about breast cancer. “I’m Gonna Love You Through It” instantly became an anthem for cancer survivors and their supporters when it was released in August 2011, and went on to earn a Grammy nomination for McBride. Roberts appeared in the music video alongside other cancer survivors and supporters including Hoda Kotb, Katie Couric and Sheryl Crow. “It meant the world to me when Robin joined me in Nashville for the music video. She is an inspiration to me, my family and my fans. I can’t wait to see her on Thursday to give her a big hug and perform for her. It’s an honor,” said the country singer. 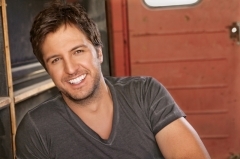 Luke Bryan will head to the Big Apple next week to make appearances on Late Night With Jimmy Fallon and Good Morning America on Sept. 5 and 6, respectively. He will perform his latest hit single “Kiss Tomorrow Goodbye,” which he co-wrote for his Platinum-selling album tailgates & tanlines. Bryan will also be in town promoting the ABC Television Special CMA Music Festival: Country’s Night To Rock, which he co-hosts with Kimberly Perry. The special will air on Mon., Sept. 17, 8:00-11:00 PM ET. He is currently on the My Kind of Party Tour with Jason Aldean and also headlining his own shows this summer and fall. In October, Bryan will embark on his fourth annual Farm Tour 2012 with eight concerts planned throughout the south, including five in his home state of Georgia.